Set up your TV, music and game systems exactly how you want them. And do it for less, with a refurbished rental TV stand. BSS-approved safety glass makes the shelves attractively sturdy. There’s space for DVD and Blu-Ray players, sound bars and Freeview boxes. Easily link cables between devices and secure them at the back of the stand. It’s great for home or office use. 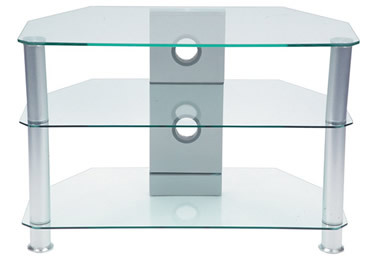 BSS-approved safety glass makes the shelves attractively sturdy.